It’s been a minute since I mentioned Hipster Runoff. In case you don’t follow Carles on a regular basis, he recently “retired” (aka wrote under the faux names of mike and becca and inevitably made some gullible people think he’d actually retired). But he’s back. Because he was ‘born 2 blog‘. 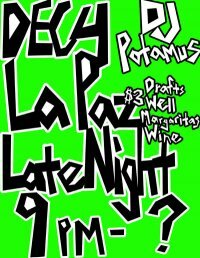 See you tonight at La Paz!